Occasionally, someone reports a problem with disappearing blog content, in Blogger Help Forum: Get Help with an Issue. My posts disappeared, right after I changed my email address! This blog owner does not realise the problems caused by changing ones email address (but not the account name), without thinking. Having changed ones email address, it's fairly easy to create a new Blogger account. A new Blogger account lets you login to Blogger - but any blogs created under a previously created Blogger account are going to stay with the previously created Blogger account. A new Blogger account is created - and maybe a new blog, too. With no blog on the dashboard, the owner creates a new blog. But, it is possible to create a new blog, with a similar name - and with no posts. D'Ohh! OK, it won't let me have "blogger-status-for-real"! How about "blogger-status-for-reall"? Now, the owner has a blog - with no posts. When later he views his (new) blog, he will see an empty blog, and think that his posts have vanished. And he now has 2 blogs, owned under two different Blogger accounts. More confusion comes, from multiple blogs. A similar confusion is sometimes experienced with new blog owners, who are accustomed to creating a new blog, to publish each article. In this case, they may end up with multiple blogs, owned under the same Blogger account. 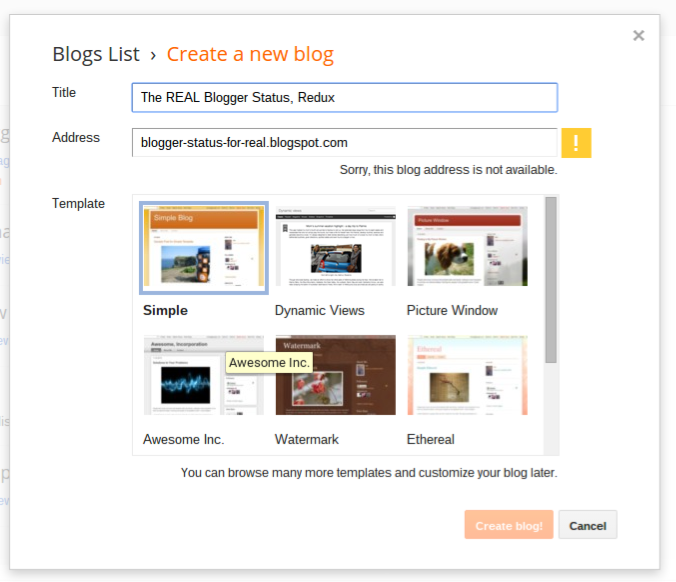 The new dashboard menu, with the "My blogs" overlay to the main menu, will cause still more confusion. People, accustomed to seeing the "My blogs" home page menu, will be unable to find the dashboard for their older blogs.